We are excited to share our late fall UPDATES! Scroll down for our EVENT NEWS ~ PUBLICATION NEWS ~ PARTNER NEWS ~ and YOUR HELP (our end-of-year APPEAL)! 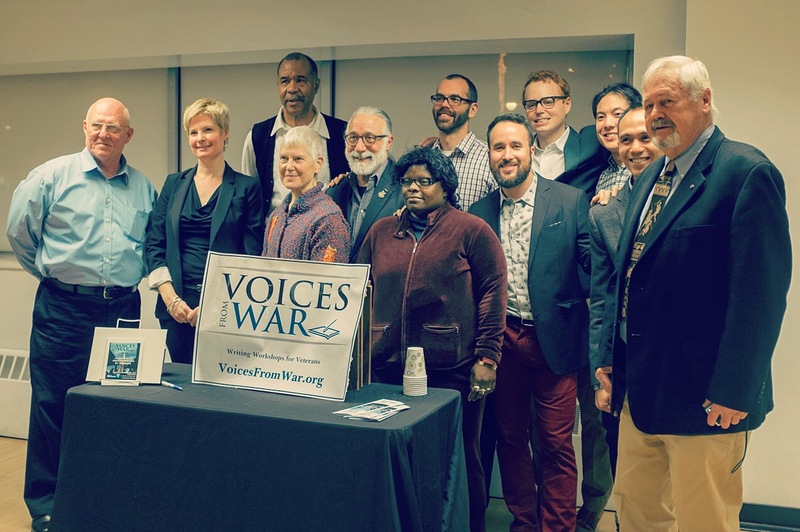 Last month, Voices From War celebrated “An Evening of Creative Writing by Veterans,” a fabulous first READING by our participants! 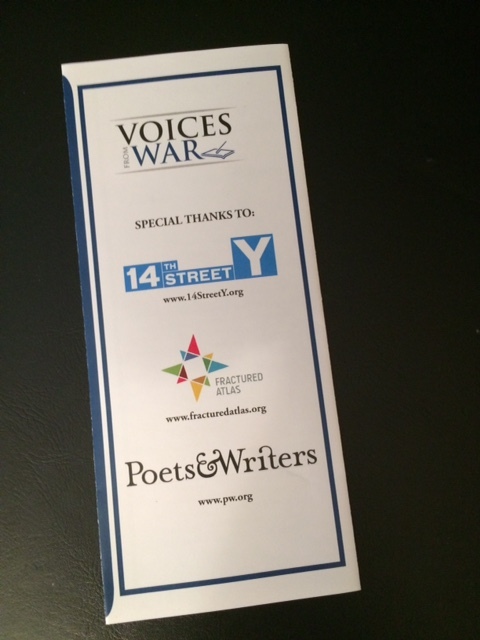 On November 21st, we filled the studio as our wonderful host the 14th Street Y welcomed recent Voices From War students in sharing their original writing with a vibrant audience of friends, colleagues, family, and supporters of Voices From War’s participants and our workshops. Twelve readers, spanning decades of military service – from Korea up through Iraq and Afghanistan – shared memoir, poetry, and fiction. One reader, a military family member, presented a dialogue, partnered with talented writer, and Army veteran, Nate Bethea, a Voices From War leader and 14th Street Y co-instructor. Thank you, Nate! We’re lucky to have Nate’s skill and dedication. It’s hard to describe and convey the effect of these narratives shared in a crowded room, with subjects as divergent and engaging, as serious and humorous, as the lives we all live, veteran or civilian: running through decades of history, a multitude of deeply personal stories. Precise prose and lyrical prose juxtaposed with musical poetry, sharp dialogue, laughter and deep thought. All shared in the community of strangers and friends. All of us a little less strange to each other, closer in our shared humanity — while more aware of the vast array of divergent experience and common experience, sometimes both at once. 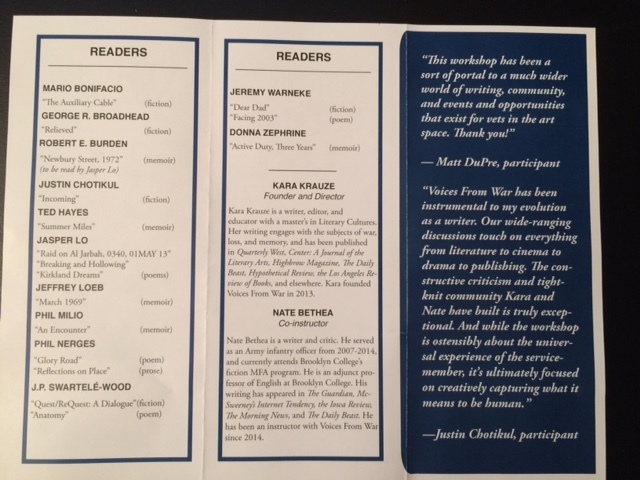 A huge thank you to our magnificent readers — for the polished words they shared and for the work they are still doing: the sentences, experiences, emotions, and phrases still finding their home on paper. 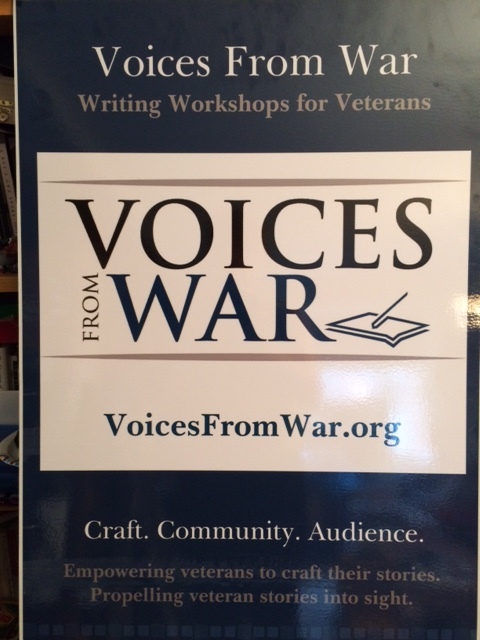 We know we are not alone in looking forward to future opportunities to bring Voices From War veterans and writers to more audiences, whether in the same room, or miles apart and brought closer through their stories conveyed on the page. 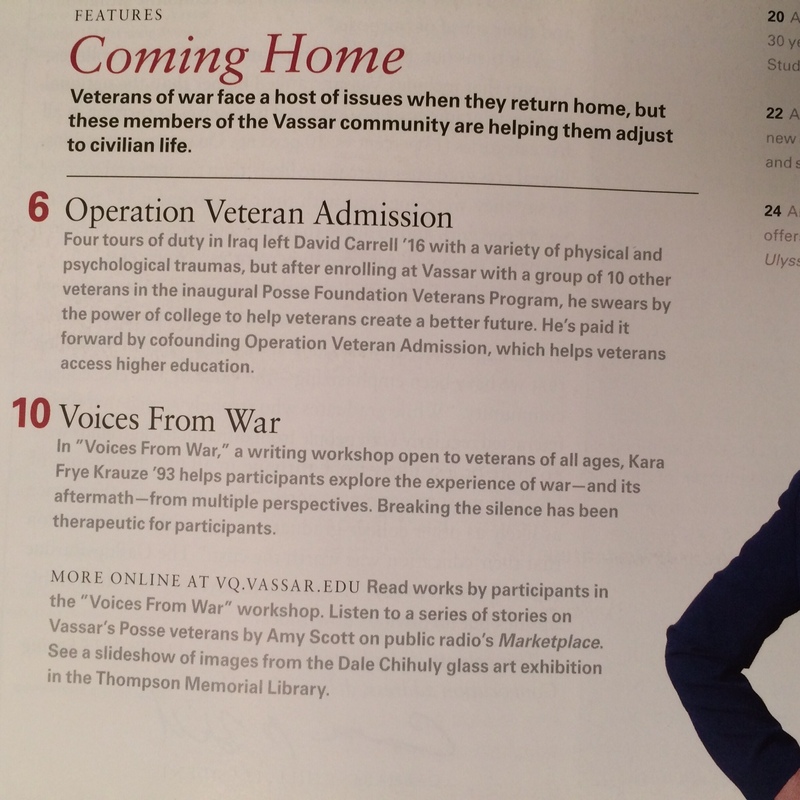 And NEXT, we are proud to share a magazine piece in the new issue of the VASSAR QUARTERLY about Voices From War, and featuring insights from participating veterans along with writing by two of our participants! And don’t miss Teresa and Matt’s original writing! 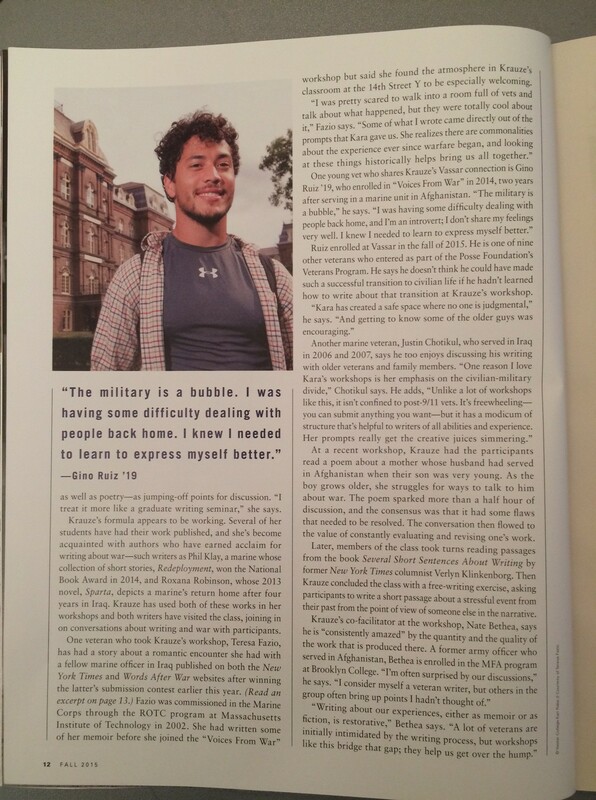 Another prior Voices From War participant, Gino Ruiz, interviewed for the article, is now a student at Vassar, part of a wonderful initiative, The Posse Veterans Program, bringing more veterans to Vassar College and several other liberal arts campuses. 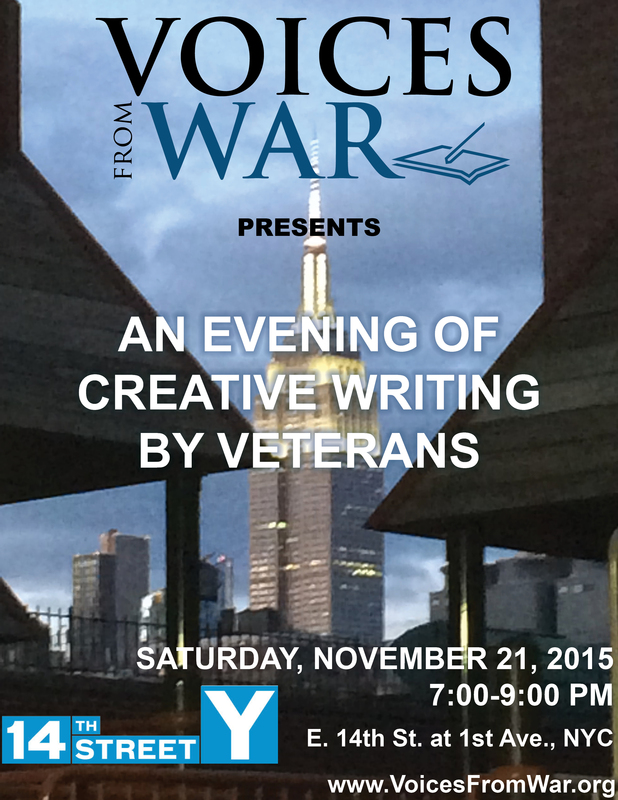 ALSO, while we’re on the subject of video, we’re excited to mention that we have video footage of several Voices From War writers reading their stories at our November 21st event. We expect to share portions of the event in the new year. 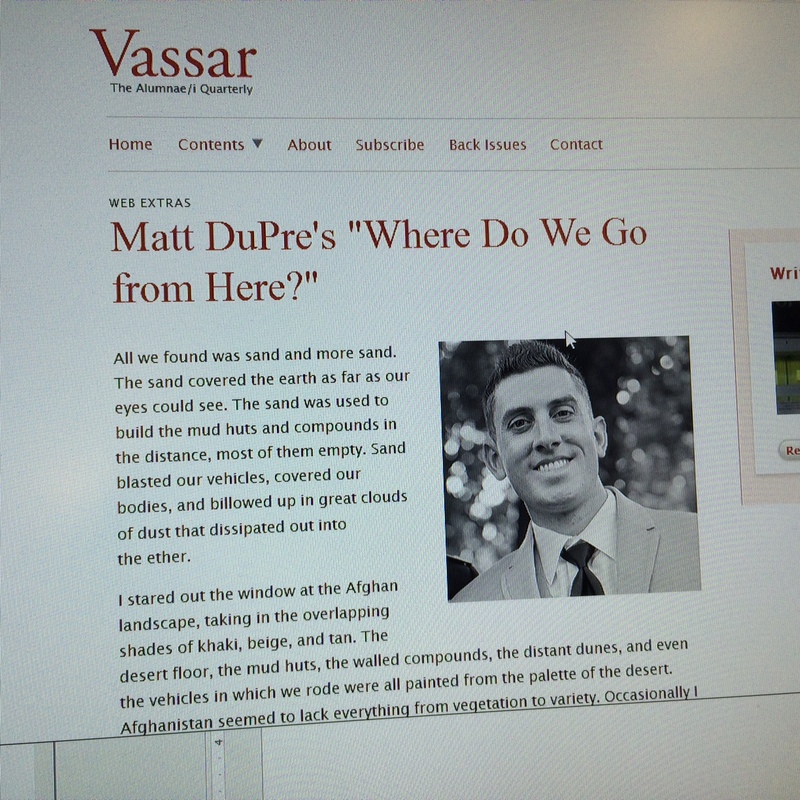 please consider contributing to Voices From War’s work. 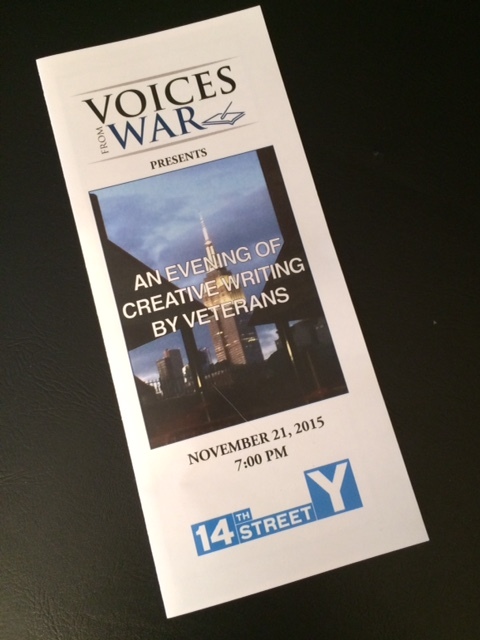 We are proud to be sustaining and strengthening our workshops — including not just our flagship workshop at the 14th Street Y in Manhattan and our “Evening of Creative Writing by Veterans” this November, but also completion of the first Voices From War collaboration at the Bronx Vet Center, with more new programming and collaborations in the works. Thank you to instructor Jeff Loeb, and everyone at the Bronx Vet Center, for a great season in the Bronx! To sustain and grow, Voices From War needs not only the dedication, grit, and passion of its leaders, instructors, and students. We need your support too. We need your passion and compassion, whether on display in what you do everyday, or activated more quietly in what you believe in, what you read and discuss, consider and share; what you know matters. We hope you share our belief that these voices matter. Veteran stories matter to those who tell them; they matter to fellow veterans; and veteran stories matter to civilians who need or want to understand more. 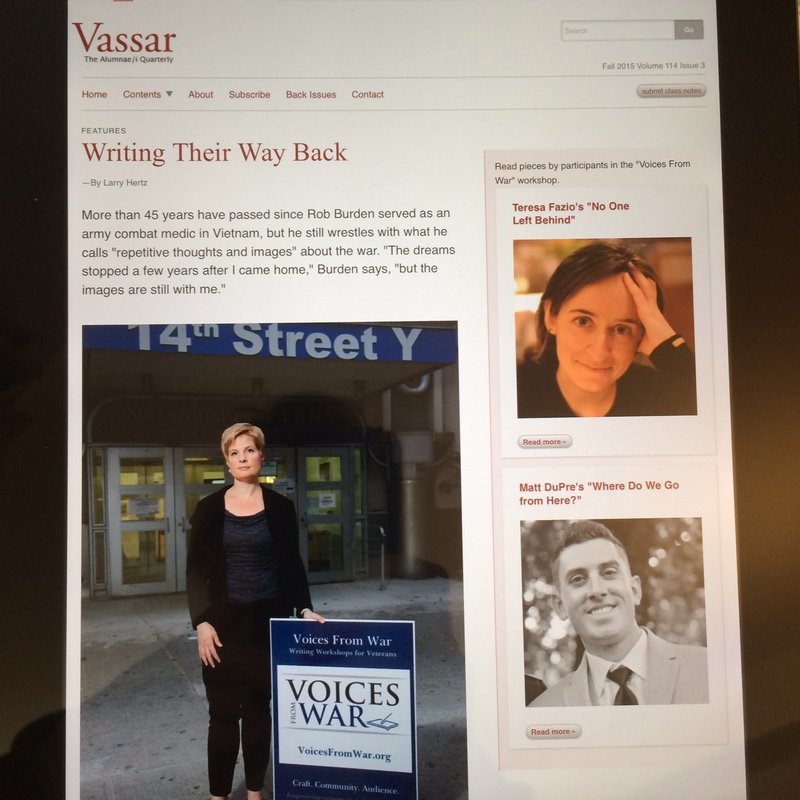 At Voices From War, we can always use more hands and expertise, more voices speaking of and sharing about what we do. And we also ask that you consider making a contribution, whether your budget allows $20, as this year closes; or, if your circumstances permit, please consider making a larger contribution, whether $50, $100 or more. EACH DONATION – YOUR DONATION – MAKES A DIFFERENCE, WHATEVER SIZE. May good tidings and shared joys of the season be with you; and know that you are with us, a crowd of individuals who make a mass, engaging with stories and those who need to tell them, and should be heard. 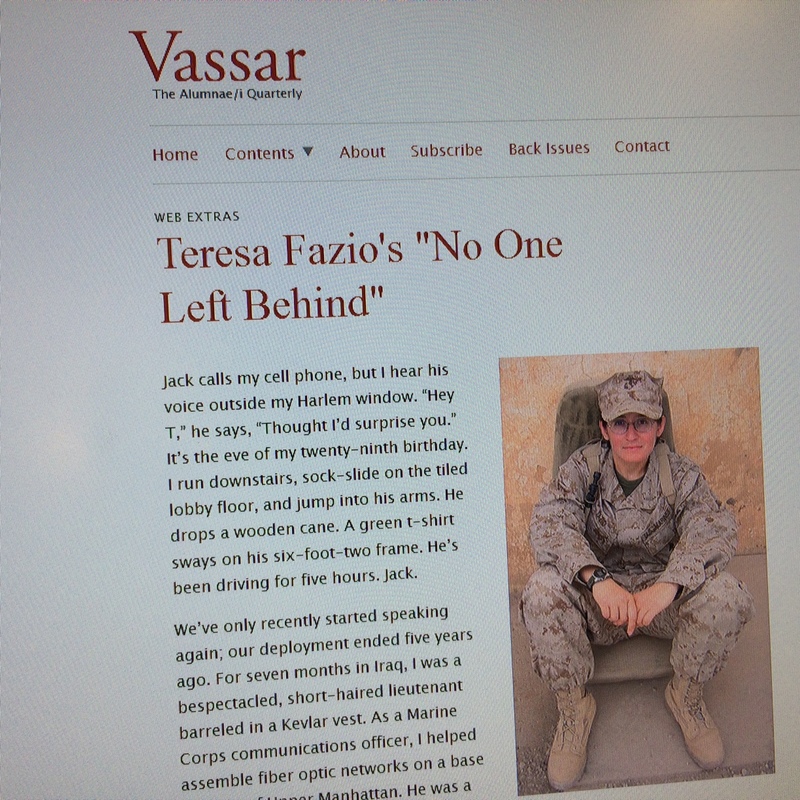 THANK YOU for all of the ways each of you support veterans, stories and writing, and Voices From War! Our December Newsletter was emailed to subscribers on Dec. 29, 2015. Want to join our mailing list? Click HERE to sign up via MailChimp. 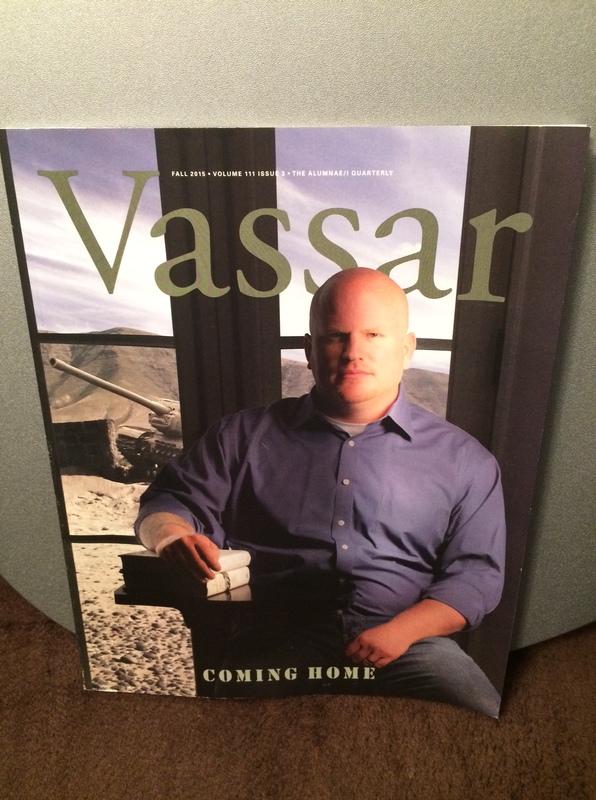 Image (near top & mid-page): Vassar Quarterly, Fall 2015, cover image (featuring veteran, Vassar student, David Carrell ’17).